Disneynature Penguins has heart and will make you see penguins (and the name Steve) in an entirely new light. You can safely take the entire family knowing that it is not only appropriate for all ages but will entertain everyone equally. Everyone knows about penguins. Almost all of us have seen them in a zoo, a cartoon, or in a film, but how much do we really know other than the fact that they waddle around and are cute? What do we really understand about their lives and mating rituals? Sure we may have seen documentaries about them before but nothing like this one. If you are a fan of nature, documentaries, a fun story or love those little tuxedo-wearing birds then you won't want to miss this film. Disneynature has been educating audiences for ten years now and for Earth Day 2019 they have decided to take penguins to a whole new level with the aptly titled Penguins. However, this isn't your typical documentary - you kind of knew wouldn't be considering that it is narrated by The Office's Ed Helms. As the movie opens we are introduced to "Steve", an Adelie Penguin living and looking for love in Antartica. As is the ritual with penguins he searches for materials to build a nest so as to attract a mate. The stakes are high as penguins mate for life so first impressions, in this case, are everything. After some time he eventually attracts Adeline and they begin to build a family. The film follows the story of these two love birds with colorful voice-acting of Steve by Helms and classic pop/rock music. 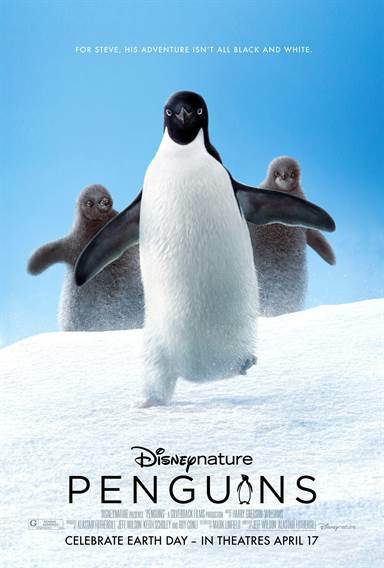 The film progressions tells a well laid of story of "a year in the life of Steve The Penguin" We see them go the trying to protect their young from the elements of mother nature, as well as, sea lions and birds of prey, until they finally sending them off on their own into the world. This film makes you feel like you are back in the Disney of yesteryears when Walt Disney produced and received awards for his nature films, or when Epcot was called E.P.C.O.T. Center in which one was entertained but also educated on attractions. For me, It provided the warm gooey center that shows that Disney is the same company it always was - a family, loving, caring, and educational company. Because of the reasons stated above the film really clicked for me because it wasn't just a documentary. It was an entertaining story where you really felt the Penguins were saying the things coming out of Ed Helms' mouth. You will find yourself laughing for most of the film while at the same time you are being educated about the life cycle of the penguin. I don't think I have ever considered a documentary something that entertains more than educates, but this film does both equally. Well-chosen and well-placed music also gives the movie some its more comedic moments whether it's REO Speedwagon's Can't Fight This Feeling or Whitesnake's Here I Go Again. While this little film will be overshadowed after a week of its release by it's Goliath brother, Avengers: End Game, it really shouldn't be. The story has heart and will make you see penguins (and the name Steve) in an entirely new light. This is a film you can safely take the entire family knowing that it is not only appropriate for all ages but will entertain everyone equally. Hopefully, Disneynature will do another documentary in the same style again in the future. For more information about Penguins visit the FlickDirect Movie Database.